As Prioress of the Benedictine Sisters of Chicago, Sister Patricia Crowley, OSB has dedicated her life to leading, inspiring, and equipping others. 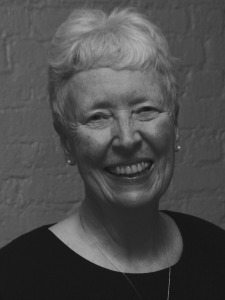 Her many years of work in the faith community has allowed people to live their lives more fully – first, as a teacher in her early days of ministry at St. Scholastica Academy and then, later on, in her various leadership positions at the Howard Area Community Center, Deborah’s Place, and the Chicago Continuum of Care. These have offered her the opportunity to help people, especially women in Chicago. She also spent time in Central America and the Caribbean in 1989-1990, as a Chicago Community Trust Fellow, where she studied women’s organizing in several countries. REALM: As you look back, what are some of the lessons you’ve learned from the best leaders you have worked with? PC: Three things come to mind for me. First, I often give credit to a former Prioress of our community for teaching me about having a sense of humor. Second, I learned from another that the best way to look at problems is to try and approach them in a poetic way – by seeing life metaphorically. When things seem foggy or baffling, that is when you have to step back and say, “This is kind of like such and such…” I often go back to Gerard Manley Hopkins’ poems and remember that “there lives the dearest freshness deep down things,” to help me gain perspective. Third, I had a colleague that worked with the homeless who had such a wonderful way of not getting caught in the moment, but rather stepping back and looking at the bigger picture. I didn’t learn that just from him, but it reinvigorated me having watched him in leadership. REALM: Is there anything you have learned from weak or ineffective leaders? PC: Most definitely. I have learned not to allow a situation to become polarized because when that happens, it’s almost impossible to get out of it. Rather than taking sides, you have to find a middle ground and acknowledge that there are different points of view. An “either/or” approach doesn’t work when you’re trying to solve problems. REALM: What was your first leadership experience that you can think of? PC: As an oldest child, I learned responsibility very young in my family. Perhaps my first outside leadership experience would date all the way back to when I was my 8th grade class vice-president. Then later on in high school I was homeroom president for two years. Even back then, I knew that leadership required a sense of responsibility. In my adult life, I was chair of the high school Theology department, executive director of three not for profits addressing poverty and homelessness, and in my late 30s, sub-prioress in my own community. REALM: As you think about community life and when you first became the sub-prioress, how did that transition to leadership go for you? PC: I was pretty young and I think we did a shift at that point to involve more people in decision-making. My first “toe in the water” was to try and be consultative with people who hadn’t had those choices. It was just a two-year experience, but it was alive and active, that’s for sure. REALM: What was that like for people who hadn’t been involved in decisions to suddenly be involved? Were they open to it? REALM: What did you take away from your leadership with The Chicago Community Trust when you were going to other countries to learn from women? PC: When we were in the refugee camps, it was amazing to see the Salvadoran women’s ability to think outside the box and imagine how things could be different. For example, the leadership in their villages had always been men, but the younger men were fighting the war and the older men were left behind. Because of this, the women were stepping up as leaders, but rather than having a predominance of women in leadership, they made it equal between men and women. For me, that was pretty powerful. I think finding that balance between persistence in what needs to happen, while still being able to see the big picture, helps people let go of the little things so that bigger, more important, things can happen. In Haiti, the women did that really well even though the barriers were significant. In both Honduras and Haiti, their inclusivity was very clear. The women all recognized the need to collaborate – even with people who might appear to be non-supporters of their work. In community organizing training, we learned that there really are no “enemies.” These women understand that principle. REALM: In your time at Deborah’s Place, Chicago’s largest provider of supportive housing exclusively for women, what were some of the leadership lessons you learned? PC: I learned that at times you have to stand alone, and at the same time you need to create a lot of opportunities for consultation about change. The last couple of years that I was there, we were trying to establish our housing projects as “no eviction” properties. Our goal was to end homelessness, and eviction just created more homelessness. We had to work proactively with caseworkers to get people moved into other places if our housing wasn’t working for a woman. It took a long time to convince staff that they could do that. Deborah’s Place has done this very successfully. REALM: How did you help these women who had so little, identify the leader within them? PC: We had really great staff. I think that just believing in them allowed the staff/group to develop reflective processes so that the women could identify themselves as gifted in various ways. REALM: When you were called into elected leadership, how did that transition go and what skills did you need? PC: This position is really a combination of pastoral and management skills. Our monastic council is a small group that is elected to make the smaller decisions, but the whole community is involved in making the larger ones. When you are in a position with a not-for-profit, you can be consultative, but in the end you make the decisions with the board. That isn’t always the case in religious community leadership, and it can be a challenge. It was also hard for me to live in the same place that I was trying to lead. It wasn’t like I could just “go home.” I try to get away at least once a month just to gain some perspective. REALM: What is your leadership style today? PC: I have the ability to see what needs to happen and oftentimes I can see things that other people don’t see. Having that gift of visioning has to be balanced with listening – especially in the religious community. Leaders must really listen and try to hear people’s fears and perspectives. Also, I delegate well when I trust someone; however, it takes me awhile to develop trust. Because of that, I often take too much on myself. REALM: When you see something that needs to happen, and it may be before others do, what skills or tools do you use to help bring others along? PC: That is where listening comes in – both individually and in a group. People need to feel that their opinions are respected. That helps me too, because after hearing others, I might need to adjust my view. REALM: What does it take for you to build up trust and have confidence in someone to delegate? PC: If I can ask for certain things and get them easily from the person in the way that I need it, that builds trust. If the person shares with me both their enthusiasm and their problems with the work, then I feel like they are assessing it and I don’t need to keep asking if they are thinking about this or that. REALM: What skills did you need to develop once you were elected into leadership for the community? PC: I needed to learn to balance pastoral reality and management reality. I also needed to figure out how to live in the place that I work. While I don’t physically live in the monastery, it’s where I spend most of my time. I have friends outside of the community, but it is a challenge to know with whom I can share things when I am discouraged. I continue to serve on one board totally outside the community and am active in the Ignatian Spirituality Project where I have the opportunity to share retreats with women who are homeless. I have also been in leadership at the Leadership Conference of Women Religious (LCWR). Both of these activities help me find some balance. Because I moved into regional leadership in LCWR very quickly, and then moved onto national involvement and assumed a role on the executive committee of the national board, I have been able to gain a depth of understanding of women religious in this country – especially as we were recently faced with the apostolic visitation and other things external to our own monastery. REALM: As you look at the constant evolution of religious life and how you plan for the future of the community, how do you bring those agendas to life for your sisters? PC: I think you do it gradually. We’re in a struggle right now because we want to do something in the realm of spirituality and offer some things to people in our area. Some in the community feel as if we are moving too fast. There is a pull in religious communities that we are aging and we can’t do more. I believe we still have the energy for a lot of things — even if we can’t do all that we used to do. It is the tension and evolution that brings up new life. I have to be patient with the tension and with the differences of opinion and feeling. REALM: How do you as the elected leader honor and call out the leader within each sister? PC: Again, I really think the key is in that word listening. That is the first word of the Rule of Saint Benedict so it is very important to us as Benedictines. It requires listening in a very active way and trying to grasp who the person is at this point in time and to call them forth gently to do what they can do.